My name is Rusty Green, and I am a self-motivated and goal oriented technology enthusiast. I have over a decade of experience working as a full-stack software engineer. I am an experienced Technology Officer, developer, entrepreneur and teacher with a demonstrated history of using technology to solve problems. Hire Me let's work together to build something great! Don't settle for average! Don't lose customers due to an under-performing or "average" website. Today's customers demand modern, intuitive, and fast content delivery, from any device. The times demand a modern web presence to set you apart from the competition. Every second counts! On average, a website will take 5 seconds to load, yet research shows 40% of people will abandon a website if it takes more than 3 seconds to load! Don't be a cookie-cutter site! Many choose to utilize templates as a low cost website solution. However, after the hidden fees and time spent, you still have an underperforming, cookie-cutter site that looks like the rest. Still not convinced I can build you a better website? In today's media-rich environment, it is critical to stand-out amongst the crowd. The smallest of details and design elements will play a crucial role in acquiring and maintaining customers. Don't limit your potential by hiring an unqualified or inexperienced web designer. I have over a decade of experience in web technologies, design, SEO, security, and systems architecture. Let me design a modern, efficient, and secure site that will set you apart from your competitors! In addition to software development, I have a strong backgroud in Geospatial Information Systems (GIS). While, I will not accept work that competes with my full-time position, as CTO, at Transcend Spatial Solutions, I will accept small mapping, analytics, and consutling jobs. Not sure if I can help you? Contact me and I'd be happy to talk to you about what I can offer or if I can refer you to someone in my professional network. I am a motivated and detail-oriented technology enthusiast who loves using technology to solve problems and help people. My formal education is in architecture, GIS, entrepreneurship, and software development. I am a Chief Technology Officer (CTO) by day, and a father, tinkerer, and freelance developer by night. Let's work together to build something great! Bed & breakfast and home rental website. Assisted living GIS analysis project. 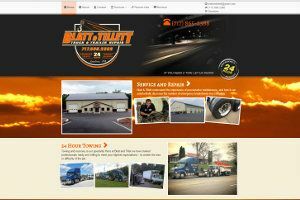 Blatt & Tillett truck and trailer repair website.